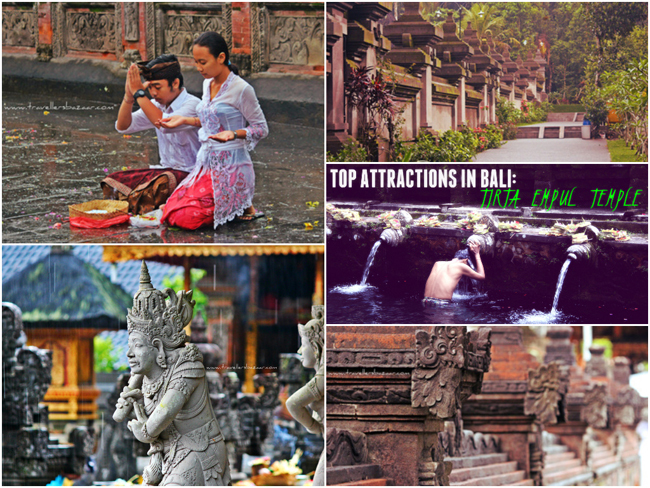 If you are in search of the ancient, the mystical, the beautiful, then look no further, Bali's Tirta Empul Temple is a must-see attraction while visiting the famed 'Island of the God's.' See the Traveller's Bazaar video feature of this stunning temple. While reviewing the stunning eco-luxury venue, Fivelements Puri Ahimsa, I managed to detach myself from the lovely resort to do some local activities. I jumped on my scooter and cruised through the countryside, stopping to visit the Ubud Sacred Monkey Forest and Tirta Empul Temple. Tirta Empul is a holy water temple, sourced from the sacred Tampak Siring spring. This 1,000 year old temple has largely been unchanged. The temple houses purification pools for locals who practice Balinese Hinduism. The temple's long rectilinear pools are carved out of stone, and feature fountainheads that fill the pools with the holy spring water. Worshipers first make an offering in the inner-court temple, then climb into the main pool to bathe, pray, and collect the water in bottles to take home. The water is believed to have curative and prosperous powers. I certainly felt refreshed and renewed after taking a dip! Tirta Empul Temple includes the traditional Balinese split gate architecture (photographed below) along with shrines to Shiva, Vishnu, Braham, Bali's Mt. Batur, and Indra. On the grounds is a large community pavilion, where you will see many families and tourist relaxing and taking in this wonderful site. Tirta Empul is located in the village of Tampak Siring, you can drive independently via google maps (as I did) or have your hotel's concierge arrange transportation. The drive is spectacularly scenic, you will cross narrow bridges, see verdant jungle scapes and paddy fields, venture through tiny villages, and come across hundreds of ancient temples along the winding road. The drive is 30 minutes from Ubud. Paris Travel Guide Video: Ten Attractions You’ll Love!